Exercise can have positive and negative effects on people with acne depending on the approach. Exercise itself is a good tool for combatting breakouts. Physical activity helps to even out blood sugar levels in the body, which are instrumental in managing acne Apple A. Bodemer, MD, UW Health dermatologist. “Blood sugar surges cause your insulin to go up and when your insulin is up, it increases androgens which are the hormones that act on the oil glands,” she explains. When this happens, excess oil is produced. The oil spills from the sebaceous glands into hair follicles blocking pores and creating the perfect environment for bacteria which irritate skin leading to pimples and lesions. Makeup and exercise are not the best of training partners. As you exercise you sweat. Brushing your skin to remove that sweat from a brow or another part of the body with makeup can lead to that makeup being pushed into and clogging skin pores. This blockage makes it harder for oils to get to the surface of the skin. Bodemer suggests removing makeup before a workout or using non-comedogenic cosmetics, which do not block pores. For outdoor workouts, covering skin with sunscreen and protective clothing is important to protect from the sun’s UV rays, but Bodemer suggests making sure that clothes you wear are loose against the skin. She explains, “Tight fitting clothing that rubs against skin can irritate hair follicles and oil glands." 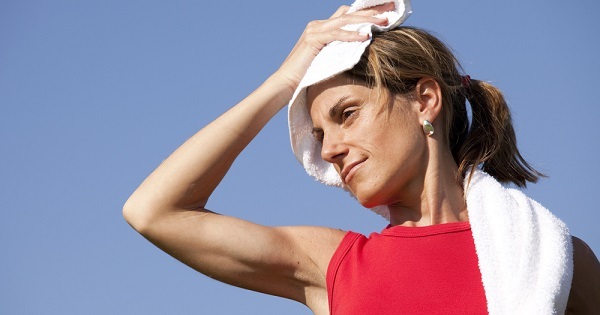 Clothing that breathes and absorbs moisture will help wick away sweat and oil from the skin where it can clog pores. Changing out of sweaty clothes right after a workout will also help keep excess moisture from having prolonged contact with the skin. Helmets and other athletic equipment that fit tightly against the skin can have the same effect as tight fitting clothes so it is a good practice to wash the impacted area after removing equipment following exercise. The sun’s UV radiation is an anti-inflammatory that helps to reduce acne, but Bodemer stresses the need to protect your skin with sunscreen and protective clothing when exercising outdoors. Swimmers and others spending time in the pool are at increased chance for breakouts. Chlorine strips skin of its natural oils, says Bodemer, which in turn sends the oil glands into oil producing overdrive. After getting out of the pool, she suggests washing and moisturize the skin. A basic white, non-scented hypoallergenic moisturizer is a good choice. Showering after a workout will reduce the chance of breakouts. Bodemer suggests doing this sooner than later to get the sweat and excess oils off your body. If you can’t shower right away, splashing water on your face to get rid of some of the sweat will help. Working out in cool places can keep sweat at a minimum, says Bodemer. Air conditioned gyms or malls, if you are a walker, are good options.